(CNN) - Democratic National Committee Chairman Tom Perez called President Donald Trump's new immigration ad an example of the President "at his worst." When asked Wednesday by CNN's Chris Cuomo for his reaction, Perez called the ad an example of Trump "fear mongering." "This is distracting, divisive Donald at his worst," Perez told Cuomo on "Cuomo Prime Time." The ad, tweeted by Trump on Wednesday afternoon, shows a Hispanic man bragging about killing police officers during a courtroom appearance and says Democrats want to allow more people like him into the country. "This is fear mongering. They're hemorrhaging, Chris, on the health care issue. Health care is the number one issue in this country. ... They can't talk about those (issues) because they're on the wrong side." "His dog whistle of all dog whistles is immigration. This has been Donald Trump's playbook for so long," Perez said, later adding that illegal southern border crossings have been at "their lowest levels since the 1970s." The DNC chairman argued that the key to solving the immigration crisis is to work with the leaders of the migrants' home countries, but that Trump's hateful rhetoric against Latinos thwarted any constructive policymaking. "The way you solve this problem is by building relationships with countries in the region. 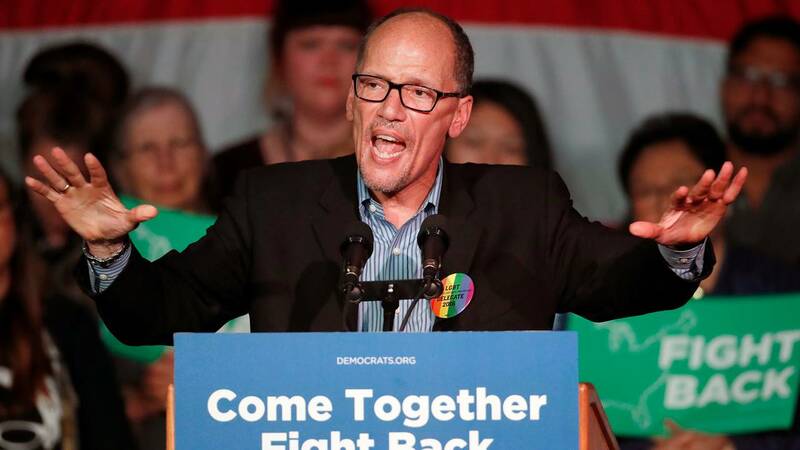 But when you demonize Latinos every day, you make it harder to solve these problems," Perez said. "That's why you see failures in immigration policy under this administration, because nobody wants to work with our country because you're constantly calling Mexicans 'thugs' and all these other atrocious names. That's why they can't do it." CNN panelists Ana Navarro and Scott Jennings weighed in later on "Cuomo Prime Time." Navarro called the new ad a continuation of a "tired, old playbook" dating back to 2016. "It's just more of Donald Trump being Donald Trump," Navarro said. "To me it's such a tired, old playbook. This is what he did in 2016: fear mongering, division, sowing discord, demonizing immigrants. And it worked. That is why he is going back to it, because it worked." When Cuomo asked Jennings why he liked the ad, Jennings replied, "I'm not surprised by the ad." "These messages are basically what Donald Trump has been talking about since he first started running for president," he said, echoing Navarro's remarks. "I think the point he's trying to make is that the Republican Party is the party of border security and the Democratic Party, at least among some candidates and in some quarters, is the party of abolish (Immigration and Customs Enforcement) and open borders." "It's not the message I would be closing a campaign on," Jennings later added, though he noted that "immigration does have high intensity scores in the polling for a lot of Republican voters."